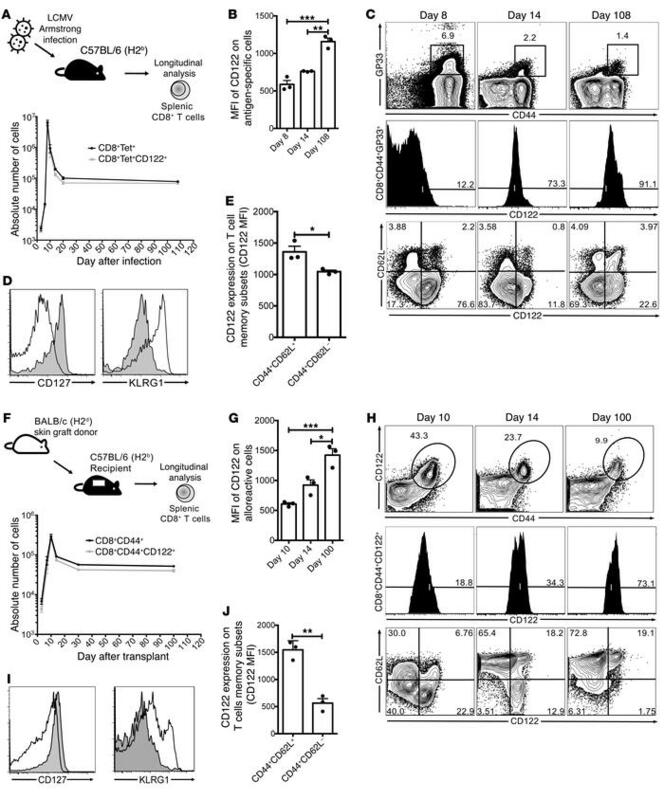 Kinetics of CD122 expression on CD8 T cells in acute viral infection and allograft rejection. (A) C57BL/6 mice were infected with LCMV Armstrong strain. The frequency and phenotype of antigen-specific (CD44+GP33 tetramer+) splenic CD8+ T cells were assessed longitudinally, and more than 95% of all antigen-specific T cells (black circles) expressed CD122 (gray squares). (B) The MFI of CD122 on antigen-specific T cells was highest at day 108 compared with day 8, P = 0.0002. (C) Representative FACS plot of data shown in A (top row) and B (middle row). Bottom row depicts changing phenotype of CD122+ cells after infection. (D) Representative histogram demonstrating that antigen-specific T cells are phenotypically CD127loKLRG1hi on day 8 after infection (unshaded) compared with a memory time point (day 108), when cells were CD127hiKLRG1lo (shaded). (E) CD122 is more highly expressed on antigen-specific TCM (CD44+CD62L+) CD8+ T cells compared with TEM (CD44+CD62L–) CD8+ T cells (P = 0.0274). (F) C57BL/6 (H2b) mice received BALB/c (H2d) skin grafts and were assessed longitudinally, similar to A. The majority of alloreactive CD8+CD44+ T cells (black circles) expressed CD122 (gray squares). (G) CD122 MFI was highest 100 days after transplant (P = 0.0011). (H) Representative FACS plot of data shown in F (top row) and G (middle row). Bottom row depicts phenotypic changes after transplant. (I) CD122+ cells demonstrate similar CD127 and KLRG1 expression at the peak of rejection (unshaded) and memory (shaded) compared with infection (D). (J) Alloreactive CD8+ TCM cells express higher levels of CD122 compared with TEM CD8+ T cells (P = 0.0016). P values generated by 1-way ANOVA with Tukey’s multiple comparisons test (B, G). Student’s t test, 2-tailed. Bars represent the mean ± SEM of 3 mice per group (E, J). All results, including FACS plots, represent 3 independent experiments (n = 3 mice/group). *P < 0.05; **P < 0.01; ***P < 0.001.